*Protecting the privacy and personal data of our customers and other visitors to this Web site is very important to us. 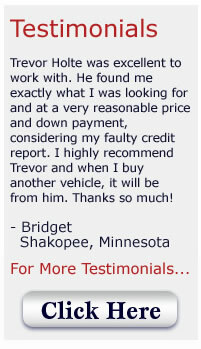 Only the minimum information needed is requested and is used exclusively for obtaining auto financing. We treat all such information as confidential and do not share, sell or release this information to any outside parties. No cookies (small amount of data sent by a Web site host computer and stored on your computer's hard drive) are utilized by our Web site.